Deep in the nest cavity, the little white fluff under the breast of the parent is a new turkey vulture chick. What a treat today! I caught video of the parent turkey vultures during their shift change. We don’t have sound from the nest, yet. We are working on getting the sound up. 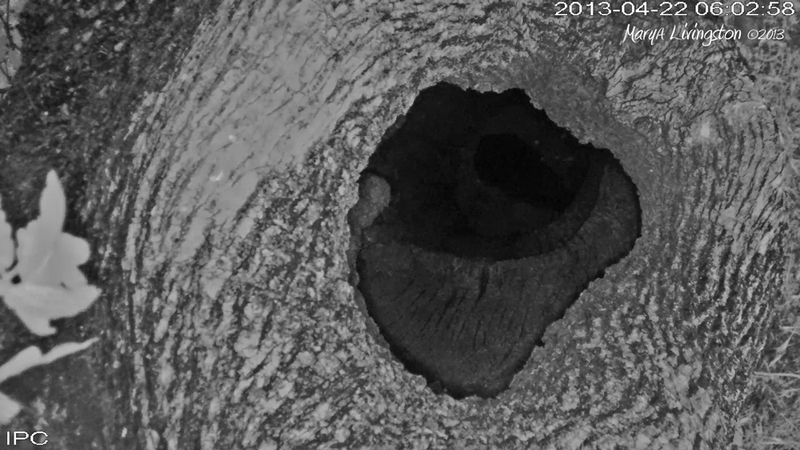 During the day we cannot see into the nest from the camera. At night, we can see deep inside with night vision. Fourteen feet to the bottom. 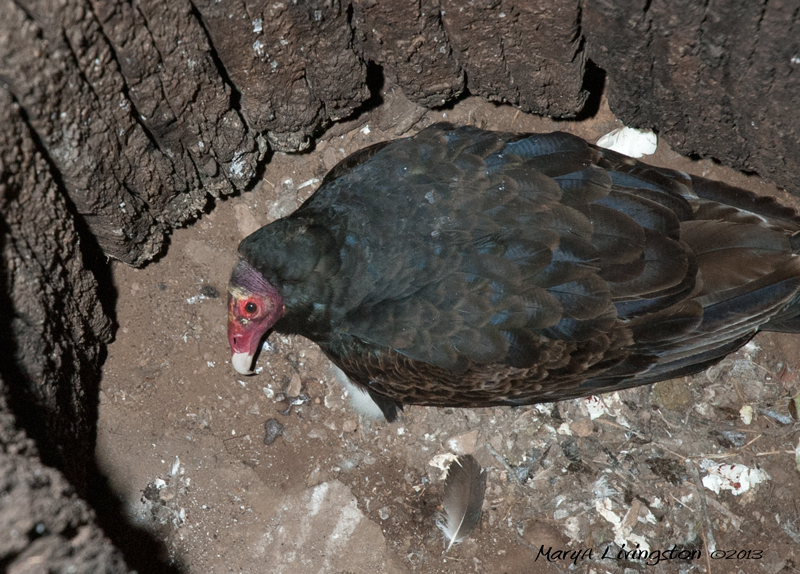 This entry was posted in Illustrations, My Backyard, Nature, Photography, Turkey Vultures, Uncategorized, videos and tagged Mary A Livingston, No Place for UGLY Birds, turkey vulture chick, wildlife photograpy by MaryALivingston. Bookmark the permalink. Just charming movie with funny music! Keep it coming! So interesting! So great to see the ‘shift change’. I’m assuming that you have the camera running all the time – when did this exchange occur – morning, afternoon? I never knew they went into that deep of a cavity. Cool. Yes, keep it coming-so interesting. Thanks for all your efforts. The time stamp on the video is 2013 04-22 12:41 pm. It took us a while to get the technical glitches worked out so the wireless would reach and record in HD. Sometimes finding time in the day for that extra job is difficult. The old system at the house was low resolution. Not sure why we are not picking up sound, so I found some music I could use with permission. I love the video and the music is so appropriate. For the turkey vulture lovers who frequent Veronica’s Garden, we’re reblogging Marya Livingston’s The Backdoor Artist. She has a vulture-cam on a nest, which currently shelters two 3-week-old chicks. Visit the site for updates on the sweet little carrion-eating fluffballs.